Savvy small business owners take a proactive approach to seizing all the business tax deductions they’re legally entitled to under current tax law. Don’t add to your tax bill by overlooking crucial write-offs. 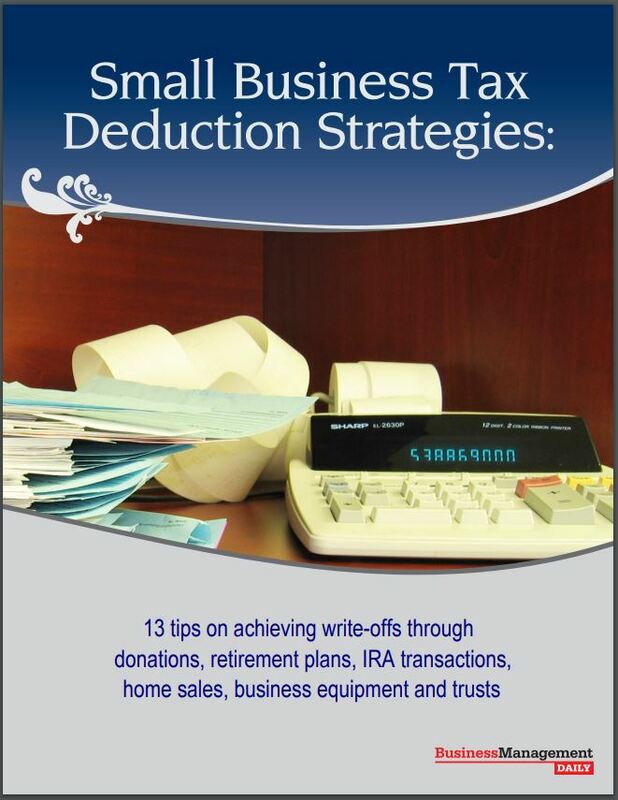 Claim your FREE copy of Small Business Tax Deduction Strategies: 13 tips on achieving write-offs through donations, retirement plans, IRA transactions, home sales, business equipment and trusts! Small Business Tax Deduction Strategies lays out 13 shrewd tax-planning moves you can make to reap the biggest tax savings. As with individuals, tax reforms could potentially affect your small business, but the prospects are still uncertain. Strategy: Take advantage of current loopholes in the tax law. By making smart moves at the end of the year, you might save your business thousands of tax dollars. We'll give you seven tax strategies that may work out for your situation. Are you having trouble collecting money for goods or services your business has provided? Consider three strategies for securing bad-debt deductions. The generous federal estate tax exemption can shield most estates from the federal estate tax, but some wealthy individuals need extra protection, especially if they own a lavish home. Strategy: Set up a qualified personal residence trust (QPRT). This allows you to remove your home from your taxable estate with a reduced or no gift tax obligation. When a small business corporation is successful, it may pay out dividends to its shareholders, including the owner running the company. Although dividends paid by C corporations are taxable to the extent of the company’s earnings and profits (a tax term of art), they generally are eligible for preferential federal income tax treatment, just like long-term capital gains. Currently, the top federal rate on qualified dividends received by an individual taxpayer is 15%, or 20% if you’re in the top rate bracket. Conversely, compensation is taxable to recipients at ordinary income rates, but these amounts are deductible by the company. Dividends are not deductible. For this reason, C corps usually prefer for payouts to shareholder-employees to be treated as compensation rather than dividends. At this time of year, taxpayers throughout the country are at risk for various types of natural disasters, including hurricanes, tornadoes and wildfires. Strategy: Keep detailed records if your personal (nonbusiness) property is damaged or destroyed. Although it is small solace, you may be able to claim a casualty loss deduction on your tax return. To paraphrase John F. Kennedy, it’s not what you do in your IRA, it’s what you can’t do. Don’t engage in any “prohibited transactions.” The penalties can effectively wipe out the benefits you received from your IRA in the first place. Other rules limit the type of investments you can make with IRA funds. Once your company’s profits begin growing and your business stabilizes, you might want to consider owning your quarters rather than renting. Compare this cost figure with your projected rental costs for 10 years and factor in expected rent increases (4% per year is realistic). Don’t overlook your company’s future expansion needs. Whether you buy or rent, you must be able to expand or contract space as needed. If you plan to own your space, you may want to consider buying a larger building and renting out part of your space on a short-term basis. If you are making a move because of your job, you may be entitled to deduct certain moving expenses. Alert: The write-off isn’t automatic. To qualify for this tax break, you must meet a two-part tax law test involving distance and time. Consider leasing business equipment instead of buying it. Generally, you can write off the entire cost of leasing without a huge upfront commitment. Also, leasing isn’t forever. If the tax breaks for buying property are revived, you may be able to quickly cash in. While some view the home office deduction as audit bait, you’ll withstand any IRS scrutiny if you know and follow the home office deduction rules. Here’s how to earn bigger and better deductions without getting off the living room couch. Your principal place of conducting business. A place to meet or deal with clients, customers or patients in the normal course of business. Have you become part of the “sharing economy” that is taking the U.S. by storm? For instance, you might provide car-driving services for outfits like Uber or Lyft or rent out a vacant home or room through Airbnb. Strategy: Be aware of the tax implications. Generally speaking, you’re treated like a self-employed individual as far as the IRS and state taxing authorities are concerned, so you must meet the usual requirements. Strategy: Have your child contribute part or all of their summer and after-school wages to an IRA. The contributions can grow into a tidy tax-deferred nest egg over time.